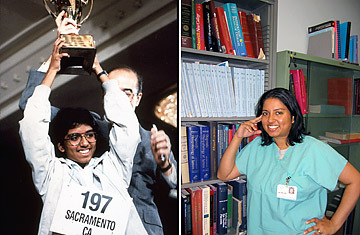 After winning the Bee in the eighth grade, Ramachandran raced through high school in three years. At age 15, she won a $10,000 Westinghouse Science Talent Search scholarship. She started Stanford at age 16. She always lists her championship on resumes and applications, against the counsel of others. "Some people who give advice say 'Only listings from college or beyond,' but it's a great conversation starter!" Today a Ph. D and M.D. resident in Pathology and Laboratory Medicine at the University of California-San Francisco, she's co-authored investigative studies on the Reproducibility of Biochemical Markers of Bone Turnover in Clinical Practice. She obviously has an eagle-eye for spelling errors. Says Ramachandran: "It's shocking to me how many people who are in tough fields are bad spellers. I had medical school professors who would misspell words on the chalkboard." She and another Bee competitor happened to be classmates in medical school and would exchange knowing smiles each time their professor butchered words. To get things into the open, she told her future husband about her history early. "He's at least as good a speller as I am," she says. Her husband Joel Moore is a physicist at Berkeley.